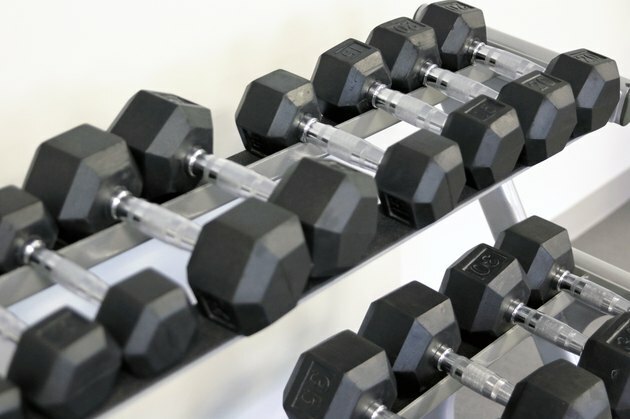 A home gym or weightlifting room wouldn't be complete without a dumbbell rack. Not only does the rack keep weights from cluttering your exercise area, it also organizes them so its easy to pick the dumbbells you need when exercising. In addition, a rack makes cleaning your weights a more efficient process. If the price point of a dumbbell rack is deterring you from having one in your home, consider making your own. Measure the length of the bed frame railings. If they exceed 20 inches in length, cut them with a metal saw. Leaving 20 inches ensures you will be able to fit at least three sets of dumbbells on each part of the rack. Smooth any rough edges of the bed frames with sandpaper to avoid injury. Measure your bed frame railings again, confirming that each railing is the same length.These railings will be the shelves on which the dumbbells will rest. Use the measuring tape to ensure the two planks of wood are exactly the same length.Cut the planks with a band saw or shape with sandpaper to ensure accurate length. Lay the four railings between the two planks of wood. Use the measuring tape to mark two vertical holes 2 feet apart on the side of each plank. Add another mark 6 inches apart from each horizontal hole. These are the marks where you will be attaching the bed frames, so make sure they match up on each side of the plank. Attach the railings to the wooden planks using the marks you measured. Use a cobalt drill bit and heavy-duty screws to attach the planks to the bed frame. At least 4 bed frame railings of 20"